We are so excited to be joining forces this year with the ATA Science Council for a combined conference. When we started talking about this endeavour more than two years ago, we had no idea whether it would be well-received. It turns out that we needn’t have worried. This conference is the first sell-out either Council can remember for a long, long time. Thank you for embracing the idea and joining us! There were some challenges along the way. Picking a theme was tough. We rejected some good ones like “To Infinity and Beyond” fearing lawsuits. 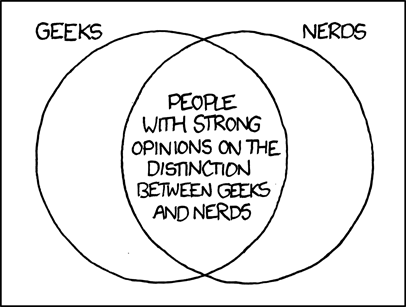 When we settled on “Geeks Unite”, a few people thought it was derogatory. In response, I defer to the brilliant Randall Munroe of XKCD fame. You are among friends here. If consider yourself a geek, wear it proudly. If you’re too cool for that, then we still love you anyhow. Welcome. Enjoy. Network. So many people have worked so hard to make this the best conference experience for you that we can. Shortly after it ends, we will be sending you a survey. Please take the time to complete it and give us honest and constructive feedback, so that we can do an even better job next time. Welcome friends, colleagues and Math/Science Aficionados! We are very pleased and excited to bring you first ever joint Math-Science Specialist Council Conference! The planning, preparation and coordination that has gone into this conference has been nothing less than amazing. It has taken the hard work of two amazing conference directors and nearly 50 incredibly dedicated and talented individuals to put this conference together. When we set out to plan this conference, I quickly realized that although none of us are professional event planners, and we are all extremely busy teachers, there was no shortage of great ideas, passion for Science & Math, and a determination to put together the best conference ever! More than two years later, I firmly believe that we have done just that! Whether you teach Math or Science, I’m sure that you will leave this conference relaxed, inspired and with many great ideas to improve your teaching practice! Now that you’re here, take a deep breath and prepare to be amazed! If you have comments, questions or ideas for future conferences or events, please feel free to share them. The Conference volunteers are easily visible in bright yellow “Geeks Unite!” t-shirts. We are looking forward to spending the conference learning with you! Welcome to the first ever joint Math and Science Council conference. We are so pleased that you were able to attend. If you are a regular attendee of either conference, you may notice that some things are being done differently this year. We adopted some practices from the Math Council, and some practices from the Science Council. Working together was a wonderful opportunity for us to learn from each other! Planning for this conference began more than two years ago, when we had initial talks about hosting a joint conference. We saw real potential for expanding our enrolment since people who teach both Math and Science would be able to go to one conference. We are excited about our keynote speakers. Chris Hadfield is a Canadian Astronaut, perhaps most famous for singing in space. He has just released the album Space Sessions: Songs From a Tin Can. He has published books including An Astronaut’s Guide to Life On Earth and You Are Here. We hope that you enjoy the joint nature of this conference and are able to find sessions that appeal to you. We tried to balance the breakouts across the grade levels and include both Math and Science in every time slot. Math and Science Council members should be easily visible in their bright yellow “Geeks Unite” shirts. If you have questions or concerns, please do not hesitate to ask one of them. Please give us feedback in the survey that you will receive shortly after the conference ends.